Enrolment numbers of international students, defined as “those who left their country of origin and moved to another country for the purpose of study” (OECD, 2009, p. 324), at Australian universities has increased with the development and improved capacity of information communication technologies. Some Australian universities, such as Deakin, have tried to address such international interests in education via the development of online classes and curricula designed for such an international student base. In other cases, Australian educators and administrators have sought to use online media to find new ways to address the educational needs of on-site students attending brick and mortar campuses. At Charles Sturt University (CSU), a rural and regional university in inland Australia, international students are receiving increased interest from university administrators and marketers as a unique sub-culture within the student population. This approach, in turn, affects how online media are used to connect with and provide education to such students. Yet, while “the spread of information and communication technology lowered the information and transaction costs of study abroad and boosted demand for international education” (OECD, 2009, p. 313), the proliferation of academic research investigating the cultural relevance, not to mention the access, uptake and competence with use of these computer-based resources, remains minimal at best. Equally important, the use of such resources remains largely nonexistent for international students in Australian universities. The introduction and widespread adoption of CMC in university education in Australia has contributed to the globalization of classrooms, virtual and physical (Ragusa, 2007) and is fundamentally altering the degree and nature of how individuals from divergent cultures interact in formal educational environments. As a result of these factors, the time has now come to examine how international, on-campus students make use of such CMC-based resources to determine the efficacy of such resources and to consider what modifications might need to be made. The implications of such an examination, moreover, are of import not only to educators in Australia, but to educators at any physical institution with a large or a growing on-site population of international students. Furthermore, the insights focused research can provide about students’ use of CMC within educational contexts can offer new perspectives and ideas that could be used to revise or refine exclusively online approaches to using CMC technologies. 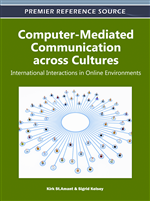 Such insights may facilitate interactions among students from different nations and cultures.